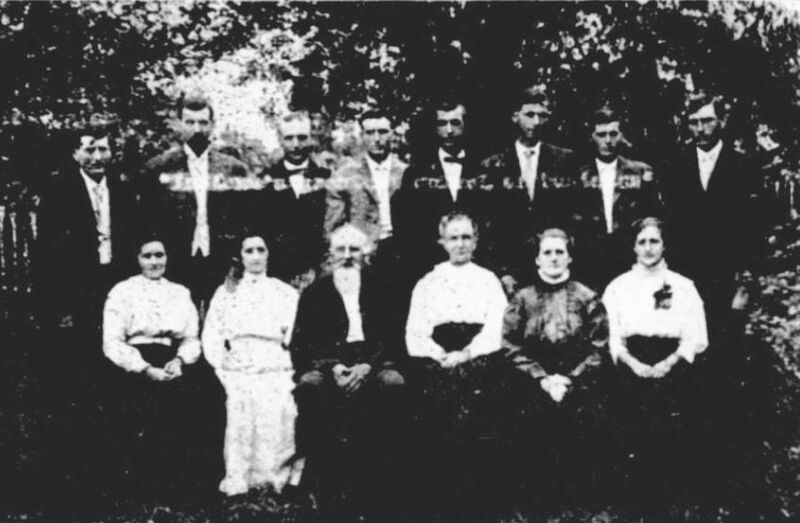 THE FRAZER FAMILY OF NEAR DALTON, KENTUCKY. Realizing that they had been blessed to the limit of God's goodness in the gift of twelve children, all living and all highly respected men and women who with their respected parents appear in the above picture the proud father and mother concluded for once since their birth to have them home at a family re-union, which took place at their home near Dalton, Ky., July 11th, 1909, when the above picture was made. Surely there are few parents in Kentucky so fortunate as to rear to noble man and womanhood, an even dozen children to call them blessed. The re-union was a happy and long-to-be-remembered one with every member present and in splendid health. They are, from left to right, bottom row, Annie L. born Nov. 12th, 1871; Lizzie O. born Jan. 6th, 1878; the father, Thos. A. Frazer, born Jan. 22nd, 1835; the mother, Mary J. Frazer, born March 24th, 1849; Kitty H. born June 11th, 1883; and Mattye B. born Oct. 23rd, 1892. Top row, left to right, Jos. H. born Jan. 1st, 1868; Dr. T. Atchison, a highly respected physician, of Marion, and president of the board of health, born Nov. 12th, 1869; Isaac S. born Nov. 7th, 1871; Jno. S. born Nov. 1875; Thadeus A. born Nov. 18th, 1880; Wm. A. born July 3rd, 1884; Clifton R. born Oct. 19th, 1887; and Geo. P. born May 1st, 1890. Three of the twelve children were born in January, 1 in May, 1 in July, 2 in October, and 5 in November. If there be a more remarkable family than this in Kentucky let their pictures appear. Source: Twice-a-Week Record-Press. (Marion, Ky.) 1909-1909, August 27, 1909, Image 2 - Chronicling America - The Library of Congress.